Discover how InLoox PM helps you organize projects more effectively with less effort. Project organization is one of the key responsibilities of project managers while the project is underway. The mission goal: Achieving the project specific and pre-defined goals and targets in terms of project deliverables, costs, deadlines and scope. Organizing the execution of any project, as simple as it may seem, is a very complex task especially because it involves a multitude of interdependet parameters. Additionally, there are unpredictabilities in any project's realization that even the most experienced project manager cannot predict. In situations when things don't quite go according to plan, it is particularly important to have a very clear overview of the big picture and the status quo. Compiling all project relevant information on deadlines, resource capacities, expenses and budgets in a software can be of great help not only to project managers but the entire team involved. Find out more how project software can support you in streamlining project execution and help you achieve successful project delivery on time and within budget. There are a variety of project organization options and parameter combinations that project managers can apply to influence the project execution. If you are struggeling with deadlines, you can increase the resource input in an effort to achieve project results within the set time limits. You can re-distribute work packages among your team, add new members to the project team and outsource work packages. Especially when increasing the workload for your existing team, in form of overhours, it is important to decrease their not project related duties. Any of the these measures will, of course, result in higher resource costs, project managers should therefore keep a close eye on the project's budget constraints. Otherwise you might end up creating a new challenge while solving an existing one. Working with a project management software helps making project organization easier and more comfortable. One of the most innovative and clever solutions for effective project organization is InLoox PM. The project software works within Microsoft Outlook, perfectly integrating with your company's pre-existing software infrastructure. InLoox solutions are extremely flexible and scalable, adjusting to your specific corporated and project needs. Thanks to the Outlook integrated technology, InLoox PM makes your email program the central project organization platform where all relevant information is compiled. Everyone involved can easily access key project data like important deadlines and milestones, project related documents, tasks and work packages. Moreover, InLoox PM facilitates streamlined project communication: Team members are automatically notified on changes to the project schedule, tasks that they are assigned and they can provide feedback on the progress they make with their specific work packages. This supports short lines of communication within the project and optimizes workflow organization and mangement. Once the project is completed, the project software provides a constitent overview of all project related expenditures, time efforts and revenues, making it a great basis for final accounting. With InLoox PM you can group and filter all your projects within Microsoft Outlook. Everyone on the project team can work within the familiar user interface of Microsoft Outlook, making project organization all the more comfortable and easy. The Outlook integrated full text search allows you to find project related information directly from within the Outlook environment. InLoox project software includes a multi-project management feature, providing a real-time overview of cross project resource capacities and utilization at any time. This provides a clear and complete overview of all key data that is the basis for effective project organization. The software allows you to create project schedules directly in Outlook with well-known planning elements like activities, work packages and milestones or simply duplicate an existing project plan for a faster planning process. You can highlight elements from the project plan in different colors for increased transparency. 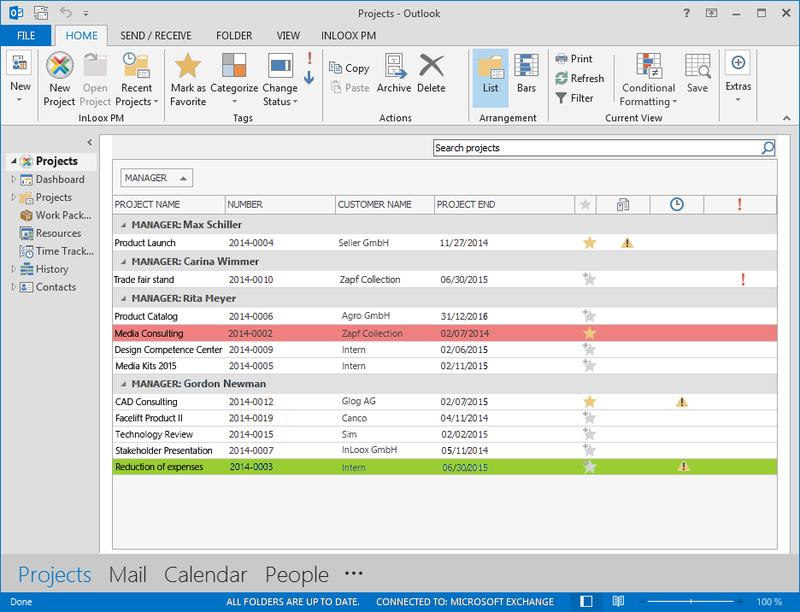 InLoox PM automatically syncs elements on your project plan with your Outlook calendar: If you like, important project activities, milestones and deadlines can be integrated as appointment entries in your personal Outlook calendar. You can also include work packages in your Outlook to-do-list, making it even easier for you to keep track of your workload and get more things done in less time. InLoox also provides you with a consisten, all time up-to-date overview of project costs. Based on the project related financial information, you can easily create calculations, reports and estimate cost development. Every budgt entry is identified with a unique consecutive numbers, making it extremely easy to trace budget items. Especially the organization and coordination of sales activities will benefit from this comfortable feature. 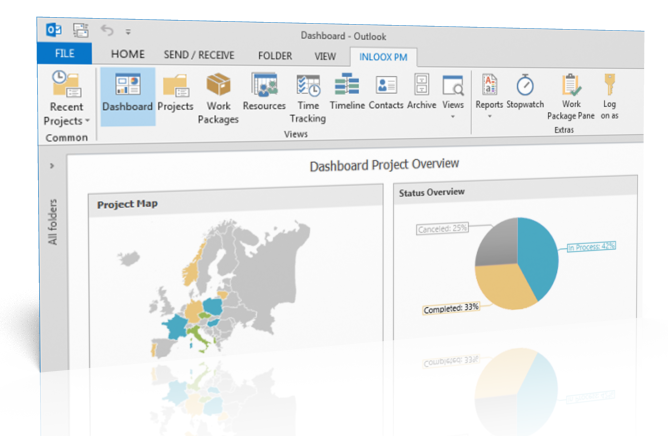 Discover InLoox PM for Outlook and find out how you can make your project organization work. Discover how InLoox can streamline your project organization. Organize Projects and Teams with InLoox • Copyright 1999-2019 © InLoox, Inc. All rights reserved.